I n an industry first, Crystal Cruises is offering just six intrepid holiday travelers a new two-day excursion to the windiest, coldest and least populated continent on the planet. In below freezing temperatures, the brand new rugged and rare overland excursion will take Crystal guests to King George Island, Antarctica. Brave adventurers will trek through remote villages and a petrified arctic forest once covered by glaciers, to scientific research bases, and to the breeding and stomping grounds of three species of penguin, elephant seals and fur seals. Available with Crystal Symphony's 19-day Christmas/New Year cruise departing December 20 from Buenos Aires, the "Extreme Overnight Adventure in Antarctica" is limited to only six guests. 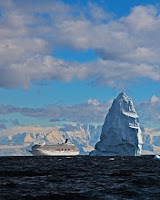 Among other destinations, the voyage features three days cruising Antarctica en route to Valparaiso, Chile. "Brace for a once-in-a-lifetime excursion that literally exemplifies the type of highly unusual, off-the-beaten-path experiential adventures our guests are seeking," says John Stoll, director, land programs. "Only a handful of people will ever have the chance to see this remarkable region so intimately." -- Two-hour hiking expedition to observe elephant and fur seals, and Villa Las Estrellas. Other adventures ashore include a helicopter ride to a humpback whale sanctuary, a 4x4 expedition to a King penguin colony, and trekking the mountains of Chile. Fares for the "Extreme Overnight Adventure" start at US$9,774 per person, double occupancy. In addition to Buenos Aires and Valparaiso, the cruise visits Montevideo, Uruguay; Puerto Madryn, Argentina; Port Stanley, Falkland Islands; Ushuaia, Argentina; and Punta Arena and Puerto Montt, Chile. Cruise fares start $8,995 per person, double occupancy. For terms and conditions and Crystal reservations, contact a travel agent, call 888-799-4625, or visit crystalcruises.com.